Log in to the Enterprise Manager web UI using the administrative account. Click Configuration and select Self-service view on the left. On the vCloud tab you will see the list of vCloud Director organization configurations that you can manage. These settings will be applied to all vCloud Director organizations without individual settings, that is, for those not included in this list of managed configurations. vCloud Director backup job settings for such organizations will be copied from default job settings as they are shown in the Veeam backup console. For more information, see the Veeam Backup & Replication User Guide. By default, the sample organization is inactive (the Repository column contains Disable self-service backup for other organizations value). For more information on modifying the sample organization configuration, see Modifying vCloud Director Organization Settings. In the dialog displayed, select the Organization from the list of those available to you. These are vCloud Director organizations from vCloud Director servers processed by Veeam backup servers (added to Enterprise Manager). Assign the Repository that will be used by organization VMs. The list includes repositories configured for managed Veeam backup servers. Consider that you cannot assign cloud-based repositories, as well as NetApp or Nimble storage systems storing snapshots created by Veeam snapshot-only jobs. Specify repository storage Quota that will be applied. You can choose GB or TB from the drop-down list and enter the required quantity. For more detailed information on job scheduling, see Schedule the Job. 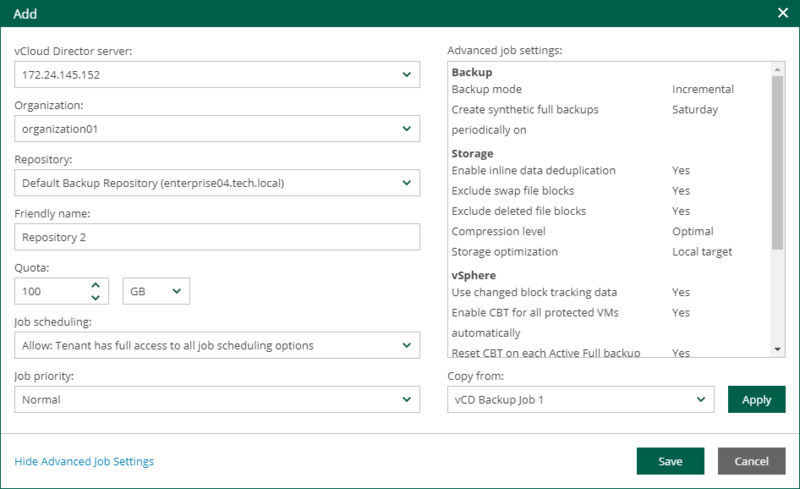 Default job settings – backup job will be configured with the standard default vCloud Director backup job settings as they are shown in the Veeam backup console. For more information, see the Veeam Backup & Replication User Guide. <job_name> – select the vCloud Director backup job from which settings will be obtained. When finished, click Apply. Backup repository settings specified for organization at step 6 (global settings) will take priority over those prescribed by selected job template. If you do not use the Show Advanced Job Settings link, default job settings will be applied to template. 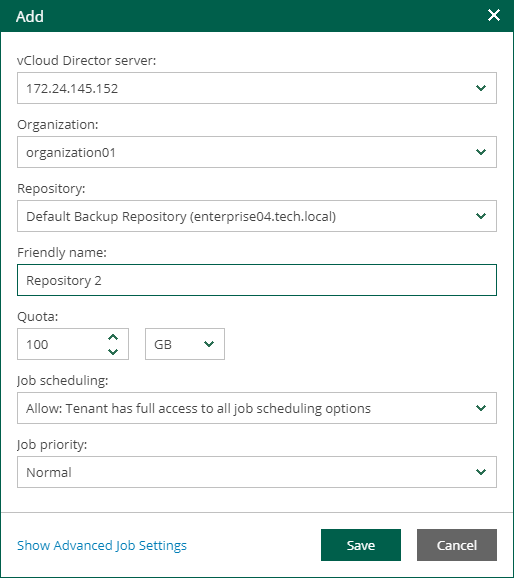 To populate the list of job templates, you need at least one vCloud Director backup job to be configured in Veeam backup console. Click Save to save configuration. Also, as an Enterprise Manager administrator, you can modify existing settings or remove the organization from the list of managed configurations. 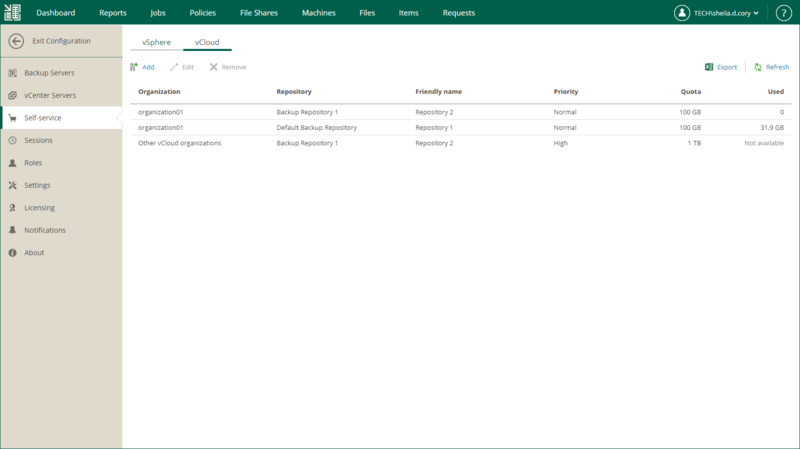 Make sure proper connection is established between Veeam backup server and Enterprise Manager, otherwise changes in the list of managed configurations will not be stored in the Veeam configuration database, and vCloud Director infrastructure in Veeam management console will not reflect the updates.